CLICK HERE for top finishers at BCAPL Nats! Campos atones for nap accident at BCAPL Nationals; Barnes has dream meet. Noel Campos lived a nightmare that needed to be put to bed for good. In 2007, playing at the top of her game, she slept through a match that could have earned her a top-16 finish in the Women's Open Singles division of the BCA Pool League Nationals. "I had played all day," Campos recalled. "I had just been put in the losers bracket. I went upstairs after eating a big meal, and - this is so stupid - I sat down and started my coffee and put on 'Seinfeld,' and fell asleep and I missed my 9 p.m. losers bracket match. "That kind of haunted me ever since. And I never heard the end of it. You know how friends are - 'Make sure you make it to your matches.' That was the running joke for about a year. I really felt like I blew it." 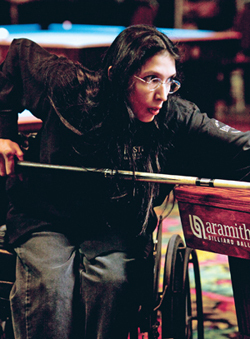 Campos was determined to exorcise that demon at this year's BCAPL National 8-Ball Championships, held May 9-17 at the Riviera Hotel & Casino in Las Vegas, Nev. The 30-year-old computer programmer from Modesto, Calif., practiced for at least an hour a day for a year - hitting balls on a table she purchased for her home or trekking across the street to her local poolhall. She knew she'd need to crack the top 16 to chase away the sickening feeling from 2007. And once she did, she couldn't be stopped. Campos beat two-time world juniors champion Mary Rakin in the final of the Women's Open Singles division to take the $6,000 top prize and eradicate any bad memories of her gaffe last year. "That kind of erased it," she said, laughing. Campos' shot at redemption was just one of the highlights during the Nationals this year. Play was fierce on the tournament's 220 tables - three times that, if you counted the endless tilted reflections in the ceiling mirrors - with $763,600 in total prize money at stake and 7,107 players fighting for a piece.